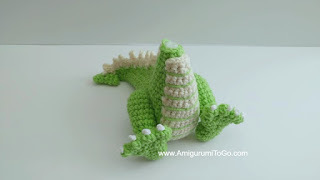 This is part four of the Small But Mighty Dragon crochet-along. In this part we will be making the legs, the feet and sewing them together. You have 2 options for the legs, you can joint them or sew them in a permanent standing position. Hvis du vil have mulighed, for at lave CAL'en på Dansk, så er det i denne gruppe. There are 4 videos for this part of the CAL. Video links are given in the pattern below. This video shows how to stuff the leg and finish it off. It also shows how to sew the feet to the legs. f/o leaving a long tail for sewing. Weave in and out of the remaining stitches, pull lightly to close up the gap. knot off. 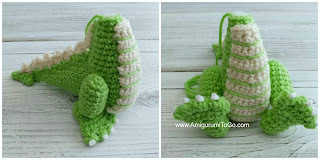 Now bring the yarn tail through the leg and out between the 5th and 6th row. knot off and leave the yarn tails hanging. You will use these for sewing the leg to the body. Set aside and make the feet. 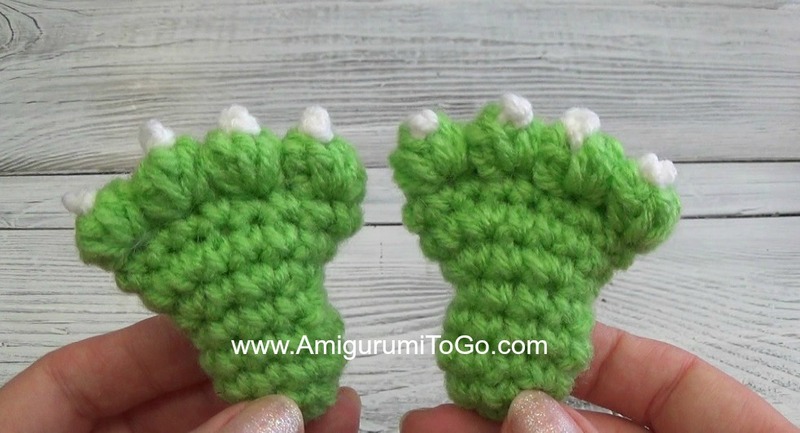 This video shows how to crochet the bobble toes and add the toenails. It also shows how to stuff, shape and close up the foot. 8) 1sc in each st for 1 row *keep your hook here, move (rotate) the piece so the last stitch you did is on the side. 9) Make a bobble using 4dc's then sl st next st from behind, (doing this from behind will pull the bobble in the right direction), make a bobble in next st then sl st the next st from behind, repeat until you have made 4 bobble toes. f/o leaving a long tail for sewing. You will use this yarn tail to close up the foot and sew the foot to the leg. Toenails or claws: using white. 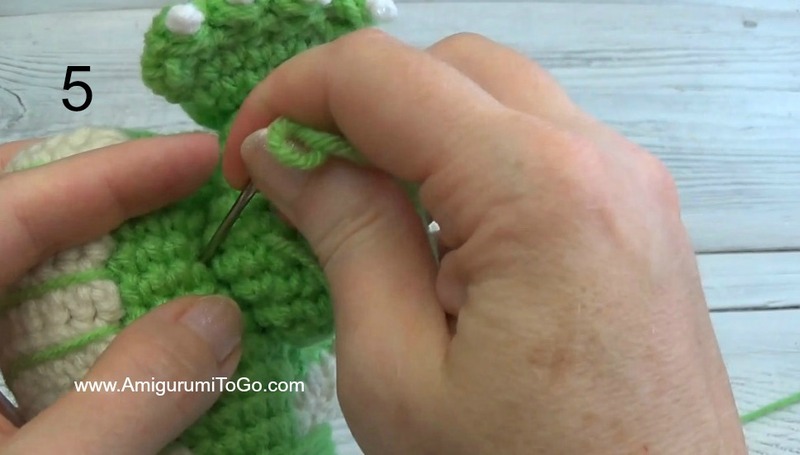 Bring the yarn through the tip of first bobble, going from the inside to the outside. Make a french knot by wrapping the yarn around the tip of the needle 3 times then go back through the bobble. 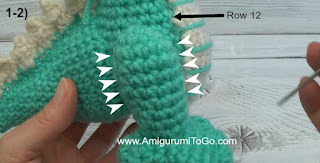 Pull both yarn tails to get the knot into the right place. Bring the yarn through the next bobble and repeat until you have all 4 toes done. Knot off the 2 white yarn tails then trim the tails. Stuff the foot, lightly stuff the top of the foot that gets sewn closed. Sew the foot closed going back and forth just under the bobbles. I made indents on the side of each foot that makes it look like there is a right and left foot. 1) Bring the yarn tail out one side where the indent will go. 2) wrap over a row, go back into the foot and come out anywhere away from the area. 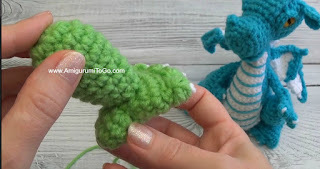 3) Pull the yarn tail and at the same time push the indent in with your other finger. 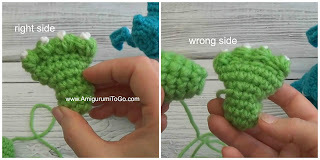 Once you have the shape you want, knot off the yarn tail and leave it. You will use it to sew the foot to the leg. Do the opposite side for the next foot. If unsure, watch the video. If you need help with this part, watch this video. The side where we sewed the foot closed is the wrong side. Sew the wrong side of the foot to the leg. The bottom of the leg should be sewn in between the 4th and 6th row. Once the leg and foot are sewn together, knot off and hide yarn tail inside foot. This video shows how to joint the legs so they move. I have shown how I jointed the legs in the video and also did my best to explain it here. Please keep in mind I am no expert at jointing but it seems to work out just fine the way I've been doing it. 1-2) Thread the leg yarn tail and bring your yarn needle in between the 9th and 10th row of the body and through to the other side of the body. Pull tight. Adjust the leg so it is sitting in the right place. Pull the yarn tail tight again. Go over a stitch and back into the body. 3-4) Come back through where you first went in. Bring the yarn needle through the inside of the leg to the other side, going over a little ways so the yarn has something to hang onto. 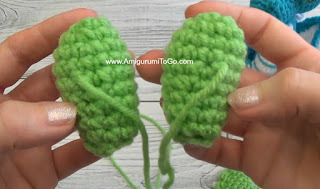 5) Bring the yarn needle through the body again, going through the same space you have been going in and out of, to the other side of the body. Pull tight and knot off. 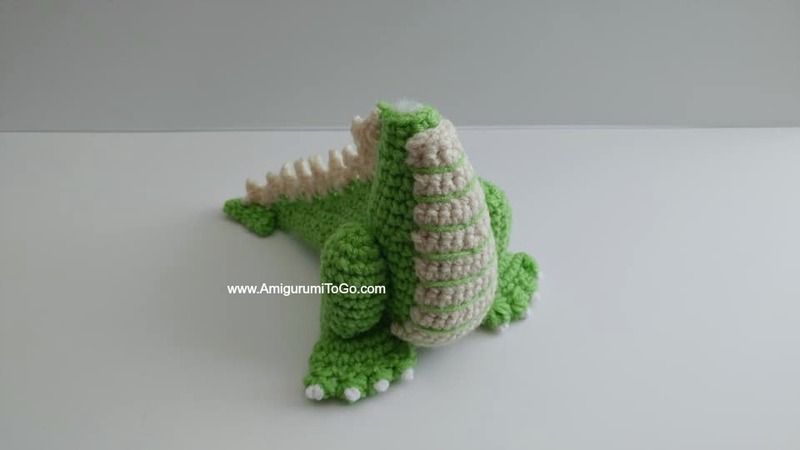 Hide yarn tail inside the body. 6) Repeat the same steps for the other leg. You will have to go behind the first leg when bringing the yarn through the body. This video shows how to sew the legs to the body in a permanent standing position. 1) Thread the needle with the leg yarn tail. Place the top of the leg in line with row 12 of the body. 2) Sew the inside of the leg to the body, weaving side to side, going through the leg and then through the body. Sew from the top arrow to the bottom arrow on both sides of the leg. Knot off when done and hide yarn tail inside body. Congratulations to us all! We are now finished part four of the schedule. You can post your photos on facebook in the comments of this post. See you soon for part five!